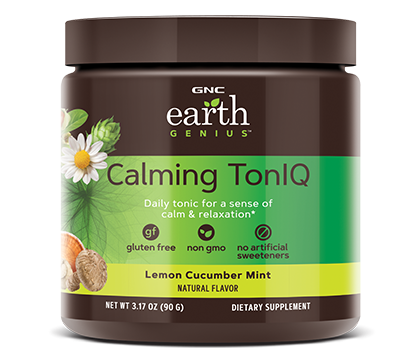 Take care of daily stresses with GNC Earth Genius™ Calming TonIQ. Relax and unwind after a stressful day with this soothing daily supplement. Add one scoop to 4 fl. oz. of cold water and mix thoroughly. For best results, enjoy two servings daily. Store in a cool, dry place., Keep out of reach of children. chill out, stress ball! take care of daily stresses with Calming TonIQ. what makes it genius? It’s enhanced with adaptogenic mushrooms, plus a clinically studied ingredient that helps create a sense of calm. I live with general anxiety and have found that I often experience anxiety symptoms at night (rapid heartbeat, tightness in the chest). While this product is not a prescription to treat anxiety, I have found that it helps calm my anxiety symptoms, usually within 30-45 minutes after taking it. I have only been taking it in the evenings because it relaxes me so much and helps me sleep better. My husband also takes, which helps him stress less and sleep better. Highly recommend this product! I love this product so much. Ive been using it consistently for 40 days and even without taking it twice a day (as the directions state) I feel so much better. I feel less in my mind, like i am more present and focused on matters at hand. I feel an overall sense of calm throughout the whole day. I recommend this product to all of my friends. This product is not made to treat anxiety, however, i feel so much better now that ive started using it. 10/10!!! Would this supplement be considered a sleep aid? BEST ANSWER: This product is not labeled as a sleep aid. However, I have found that when I take it in the evening, I do sleep better since it helps calm my anxiety symptoms. It also relaxes my husband and helps him sleep better too. No. It didn't make me sleepy, but took the edge off. It would be a great product to use in combination with valarian or melatonin.